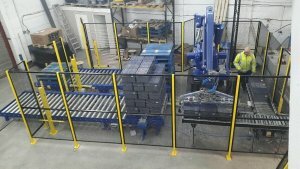 Today we are adding the finishing touches to the first of six robotic palletising systems for a large, blue chip distribution company based in the UK. This robot palletising system collects customer tote bins via a specially manufactured robot head, powered by an ABB IRB660 robot. The tote bins are collected in batches of three from one of two roller powered in-feeds and then palletised as per the customers exact specifications and requirements. The conveyor in-feed we opted for uses powered rollers to transport the tote bins to their designated collection points. 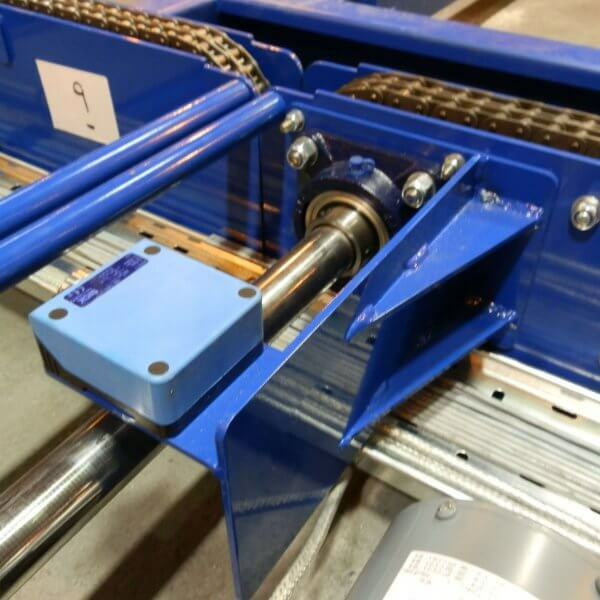 This system incorporates two collection areas, one area in-line with the in-feed conveyor, and another collection area at 90 degrees to the in-feed where the selected tote bins are transferred via a cross transfer belt drive. The robot head used on the gripper system has been manufactured specially to accommodate the profile of the customer tote bin units. Due to the bin profiles intricate nature, there was a significant amount of design work that had to be carried out before we were able to confidently propose a handling system that met the customer’s needs. After a number of weeks, we were in a position to offer our customer a solution that was both secure and efficient, as well as meeting the customer requirement and being fit for purpose. This system has also been designed so that the robot collects an empty pallet from the pallet stack and loads it onto the stacking area. This is all achieved using the same gripper head as is used to collect the tote bins. Once palletised to the customer’s requirements, the loaded pallet is then conveyed out of the stacking area via a driven roller system, making it’s way towards the end of the line and ready for fork lift truck collection.